25 years ago this year, Interreg was developed as a Community Initiative in with a budget of just EUR 1 billion covering exclusively cross-border cooperation. 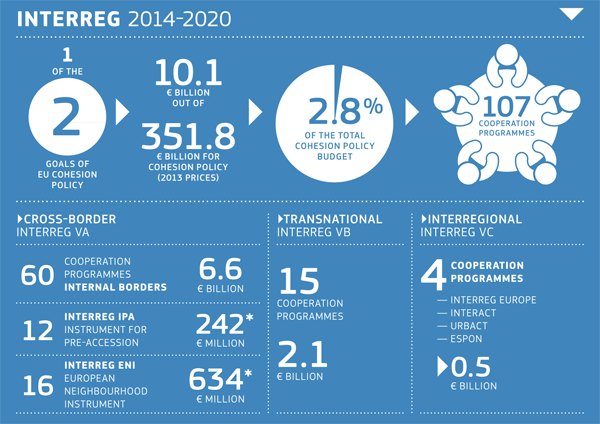 Later, Interreg has been extended to transnational and interregional cooperation. Over the years, Interreg has become the key instrument of the European Union to support cooperation between partners across borders. The aim: to tackle common challenges together and find shared solutions - whether in the field of health, research and education, transport or sustainable energy. Interreg programmes are funded by the European Regional Development Fund to support the harmonious development of the European Union's territory at different levels. The interregional co-operation programme, INTERREG Europe (former Interreg IV C), and 3 networking programmes (Urbact III, Interact III and ESPON) cover all 28 Member States of the EU. They provide a framework for exchanging experience between regional and local bodies in different countries. ERDF contribution: EUR 500 million.